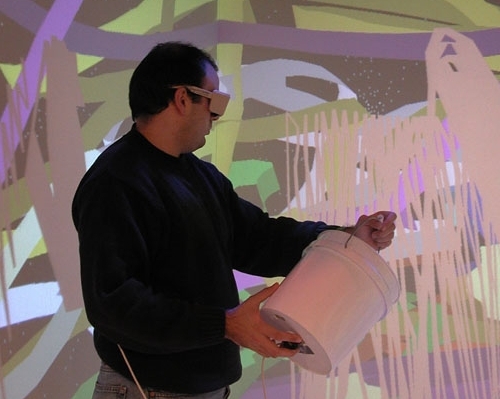 CavePainting is an artistic medium that uses a 3D analog of 2D brush strokes to create 3D works of art in an immersive virtual reality Cave environment. Like charcoal lines or paint strokes, these 3-dimensional marks are a fluid, highly flexible visual language that is brought to life by an interface responsive to the artist. 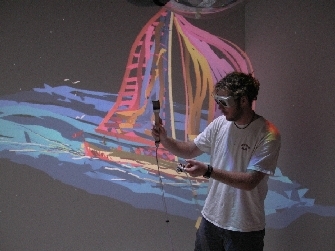 The virtual reality interface is composed completely of physical props and gestures. There are several ongoing artistic collaborations using the system. 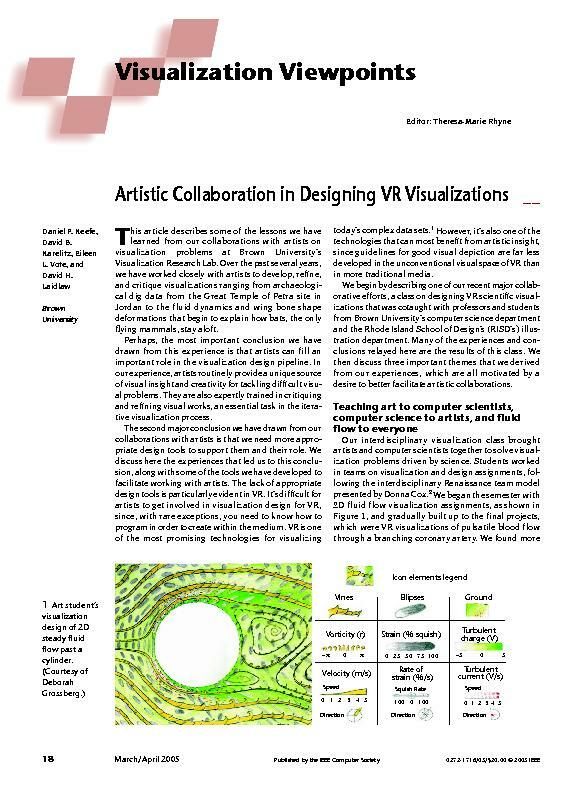 In addition, researchers are currently investigating leveraging artistic theory and lessons learned about visual representation in the Cave to help solve visual representation problems in scientific domains. Microsoft Corp. Donated one Tablet PC for Scientific Visualization Research. Raimund Dachselt and Anett Hubner. Three-dimensional menus: A survey and taxonomy. Computers and Graphics, 2006. In Press (pdf) (bibtex: Dachselt-2006-TMS). C. Davies, W. Tompkinson, N. Donnelly, L. Gordon, and K. Cave. Visual Saliency as an Aid to updating Digital Maps. Computers in Human Behavior, 22:672-684, 2006. (pdf) (bibtex: Davies-2006-VSA). Benjamin Watson. Broadening our Collaboration with Design. IEEE Computer Graphics and Applications, 26(5):18-21, September-October 2006. (pdf) (bibtex: Watson-2006-BCD). Gevorg Grigoryan and Penny Rheingans. Point-Based Probabilistic Surfaces to Show Surface Uncertainty. IEEE Transactions on Visualization and Computer Graphics, 10(5):564-573, September/October 2004. (pdf) (bibtex: Grigoryan-2004-PBP). Christopher G. Healey, James T. Enns, Laura Tateosian, and Mark Rempel. Perceptually-Based Brush Strokes for Nonphotorealistic Visualization. Transactions on Graphics, 23(1), January 2004. 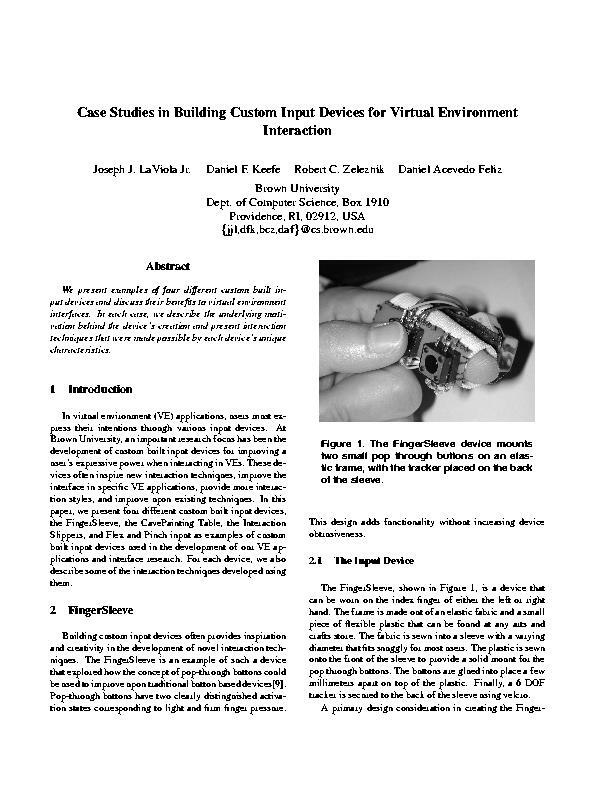 (pdf) (bibtex: Healey-2004-PBB). BDH Editor. Daniel Keefe's 'Sailing a Dhow in Tanzania: A Cave Painting', April 2003. (pdf) (bibtex: BDH-2003-DKS). Tovi Grossman, Ravin Balakrishnan, Gordon Kurtenbach, George Fitzmaurice, Azam Khan, and Bill Buxton. Creating Principal 3D Curves with Digital Tape Drawing. In Proceedings of Computer-Human Interaction Conference, pages 121-128, 2002. (pdf) (bibtex: Grossman-2002-CP3). Ravin Balakrishnan, George W. Fitzmaurice, Gordon Kurtenbach, and William Buxton. Digital Tape Drawing. In Proceedings of ACM Symposium on User Interface Software and Technology, pages 161-169, 1999. (bibtex: Balakrishnan-1999-DTD). A.T. Pang, C.M. Wittenbrink, and S.K. Lodha. Approaches to Uncertainty Visualization. The Visual Computer, 13(8):370-390, November 1997. (bibtex: Pang-1997-AUV). S.K. Lodha A. Pang and R.E. Sheehan. UFLOW: Visualizing Uncertainty in Fluid Flow. In Proceedings of IEEE Visualization 1996, pages 249-254, 1996. (bibtex: Lodha-1996-UVU). C.M. Wittenbrink A. Pang and S.K. Lodha. Glyphs for Visualizing Uncertainty in Vector Fields. IEEE Transactions on Visualization and Computer Graphics, 2(3):266-279, September 1996. (bibtex: Wittenbrink-1996-GVU).